Less pain during dressing change. Locks in bacteria and toxins. 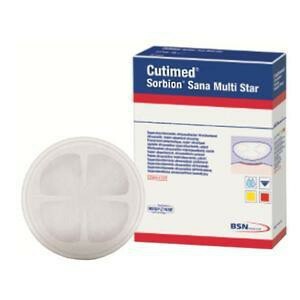 The Multi Star is part of the exclusive Cutimed® Sorbion® Sana gentle line of wound dressings. It has a 3D design to be extra gentle in the wound bed to make dressing changes less painful for individuals with pain or contact sensitivities. The purpose behind the Multi Star design is to create high flexiblitity to conform nicely to difficult-to-dress sites of the body such as the elbow, foot, chest, axillae, heel and ankle. In addition, the wound dressing is a Super Absorber meaning it is highly effective in soaking up moderate to high amounts of wound exudate. BSN Medical's hydration response technology soaks up toxins and bacteria while maintaining a moist wound environment needed for faster wound healing. The dressing can be worn up to four days.